It has been another great week for the stable with a double at Bendigo on Thursday - and we are looking for the winning run to continue with a nice group of runners at Eagle Farm and Sandown. Including two of our best fillies - Serenade and Alaskan Rose (pictured) - who are contesting feature races on the Eagle Farm programme. Terrific when second from a tricky gate in the Bright Shadow Stakes last time out, Serenade has drawn a bit better in the Listed Juanmo Stakes and we are expecting another bold showing from the consistent filly. "She has been doing well up here," Michael Moroney said from Brisbane, "and she deserves to break through for a stakes victory." Also thriving in Queensland is Alaskan Rose who had to do too much work from a wide gate in a rough The Roses last start. She has unfortunately again drawn out in the Group One Queensland Oaks but over the 2400m should be able to find herself a nice position. 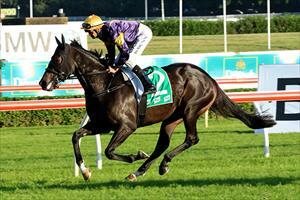 "I have been really happy with her," Moroney enthused - "she is flying!" "She hit the line hard last start, her's was probably one of the best runs in the race - Robbie Fradd said he thought she was going to go down at one stage." Our two Sandown runners also look to be good chances, kicking off with War Legend War Legend who has been freshened for a drop back to the mile of the Ladbrokes Handicap. "His gate is a bit of a tricky one (10) but he is going really well and it looks the right race for him." "He is down in class and Jake Bayliss has been riding in great form for us." Extra Noble also looks to have struck a suitable race, the imported five-year-old good at Flemington last time out and better for recent racing. "He is getting to his peak now and he should get some cover from the inside barrier."